EZ Gel Extraction Kit is a silica membrane based spin column format kit for isolating DNA fragments from all types of agarose gels and buffer systems. This kit can also be used for purifying DNA from enzymatic reactions. The purified DNA can be used for any downstream molecular biology applications. 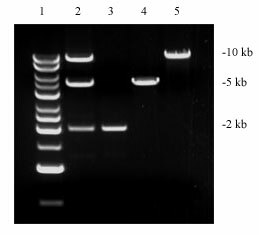 DNA fragments (size indicated) before and after extraction with EZ Gel Extraction Kit. A. Lane 1, 1 Kb MW marker; Lane 2, DNA fragments before extraction. The amount of DNA loaded equals 90% recovery rate after extraction. Lane 3-5, DNA fragments after gel extraction. 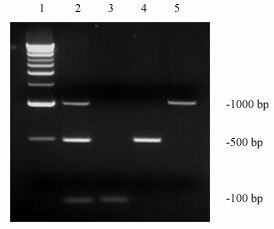 Samples were analyzed on a 2% agarose gel with TAE buffer. B. Lane 1, 1 Kb MW marker; Lane 2, DNA fragments before extraction. The amount of DNA loaded equals 85% recovery rate after extraction. Lane 3-5, DNA fragments after gel extraction. Samples were analyzed on a 0.8% agarose gel with TAE buffer.